Posted on 4. February 2018 by P.J. Everybody who is using Spring these days knows that Spring has many annotations that are just used to group together a couple of other annotations and so to keep the number of annotations small. For example the @RestController annotation combines basically the @Controller and the @ResponseBody annotation so that the user only needs to annotate his class with one annotation instead of two annotations. The JEE @Stereotype annotation works basically the same way. In this post I show how to define and evaluate such meta annotations in plain Java without using Spring or JEE. In addition to that there is a method dayOfWeekAnnotations() which returns the annotations for the single days, but not the grouping ones. To evaluate this, I create a class named Office in which I first create three different employees, each of a different type. Then I iterate over all the annotations for the single days – remember, the employees use the meta annotations, not the ones for the days – and print out which of the employees works on which day. For this I use a utility class MetaAnnotationUtil which I will show after the output. This post has shown that with a little recursive implementation, meta annotations can easily be processed. In a real life scenario I would add caching mechanisms to make sure that the annotations for classes and methods are not repeatedly searched. They can be cached as they are created on compile time and do not change when running. And, when you are already using Spring and just need to add some custom meta annotations to your project: Use Spring Core’s AnnotationUtil class and do not write something of your own! Posted on 4. January 2018 by P.J. I have published a Java version of the demo I described in this post on GitHub. Everything is the same only the language used for the implementation is changed to Java. So for a description please refer to the linked post. Posted on 2. July 2017 by P.J. As I am bad in creating cool names for projects I just put together the first letters of the used tools and named this whole thing kovasbak. The complete source code and project is available on GitHub. I am just using the default values, that gets Kafka runnning on port 9092. I am using Java 1.8.0_131 and IntelliJ IDEA, but the project is totally maven based, so you can use the IDE / editor of your choice. To create the project, I used the Spring Intializr integration in IntelliJ, but of course you can create the project by using the Spring Initializr website. I just selected Kotlin as language, Java version 1.8, Spring Boot 1.5.4 and additionally selected web/vaadin and io/kafka. In this post I will only show the relevant lines from the code, I will skip package and import statements, the full code is available at GitHub. The @EnableKafka annotation is used to tell Spring Boot to pull in the kafka related classes and libs. else -> text.value + "<br/><em>$user:</em> $message"
It is marked as a Vaadin UI with @SpringUI, @PreserveOnRefresh keeps the session when the browser is reloaded, and @Push marks this for server-push when new messages arrive from Kafka. The class implements an interface KafkaConnectorListener which is described together with the KafkaConnector class. This sets up the basic layout with the ChatDisplay and the other UI elements, registers the ChatUI with the KafkaConnector. The click handler for the send button is set up so that the user name and the content of the message TextField are sent to the KafkaConnector (see marked line). This shows a modal window where the user’s name must be entered. the code is asynchronously from a different thread and must be wrapped to be run on the UI thread. Executing the code in access() in combination with the @Push annotation on the class results in a server push to the client which is necessary so that the new messages are immediately shown. val key: String = consumerRecord.key() ? : "???" val value: String = consumerRecord.value() ? : "???" First I defined the KafkaConnectorListener interface which the ChatUI class implements so they can be registered for new messages. The KafkaConnector has a list of listeners and the methods to add and remove listeners. Nothing special here. For sending a new message to kafka, the send method uses the injected KafkaTemplate (which comes from the spring-kafka library) to send the data to kafka by using the username as key and the message text as payload. The topic name that is used is kovasbak-chat. By marking the receive method with @KafkaListener the method is called every time when a message in kafka arrives from any client. The data is parsed for the username and message body and the it is sent to all the registered clients. And finally there is a companion object with a Logger. I use a random kafka consumer-group id so that each instance of my webapp gets all messages, I am not interested in old messages and define the host and port of the kafka broker. 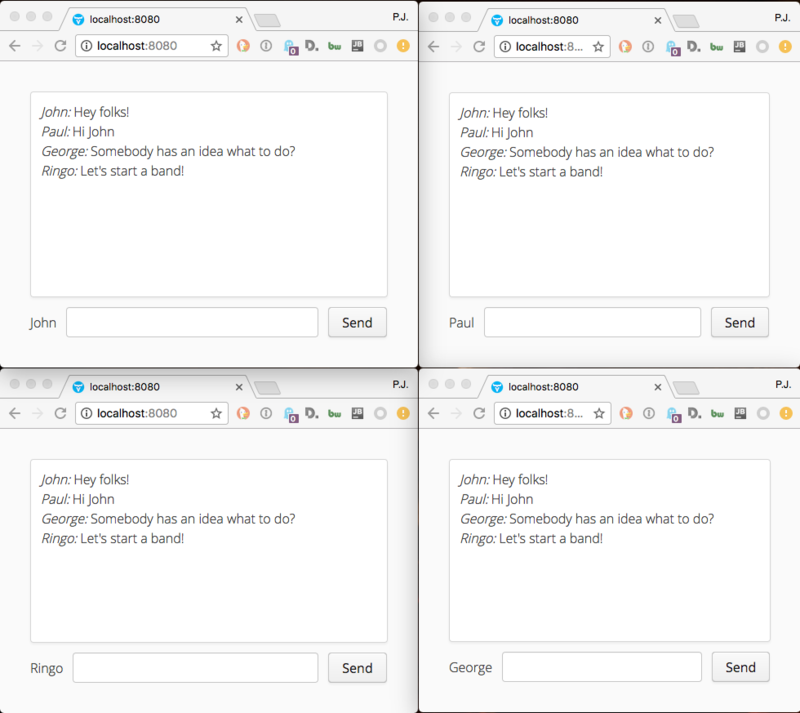 To sum it up: with just a handful of code lines we have a scalable web-based chat-service which uses a scalable backend for message processing.